Where do I use my Opodo voucher code? Choose a code from NetVoucherCodes.co.uk, copy it and follow our link to Opodo’s website. Next, choose your flights and hotel (if applicable). Enter all of your details then paste your code into the ‘Promo Code’ box. Proceed and enter your payment details to complete the booking. Tailor make your own Opodo holiday or pick from a wide selection of pre-made packages to find the holiday of a lifetime. Discover a variety of Opodo Holidays including package holidays, city breaks, cottage retreats, beach resort holidays and cruises, or enjoy car hire options that allow you to travel around your holiday destination at your own leisure. 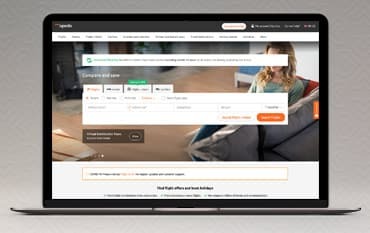 Use the Opodo fast and powerful search engine to easily search and compare flights by the top low-cost and budget airlines like Ryanair, easyJet, Jet2 and many more and find affordable flights to great destinations like Ibiza, Barcelona, Rome, Alacente, Malaga, Lisbon, Paris and many more. Opodo’s assortment of properties, flights and travel extras give the modern traveller a broad and inclusive scope of options, and with all holidays ATOL protected, deals on travel insurance and car hire, and all online bookings firmly secured, you needn’t worry about the niggling details when you’re getting ready to enjoy your big break. Booking flights with Opodo could not be easier. Not only does Opodo offer affordable prices and maximum convenience but also competitive price comparison tools that can find you cheap flights to destinations all over the globe. Opodo also provide more flight combinations than anywhere else with single trip, return flights and multi-stop flights to fit in with your individual travel plans. Book your flights online at Opodo or use the app and receive great prices on flights to France, Istanbul, New York, Amsterdam, Dublin, Edinburgh and London. Fly with trusted companies like Ryanair, Flybe and easyJet and read real flight reviews before you book to ensure you're making the right choice. City Breaks are great for short but sweet holidays with a loved one, allowing you to experience a new country without spending a fortune. With a city break you can make your getaway what you want, whether that's an action-packed non-stop break, a carefree romantic excursion or a heavily filled historic and culture-rich trip to tick off your bucket list. Opodo make heading out on a city break easy with package hotels and flights to popular cities like Rome, Dubai, Cuba, Barcelona and London. Select your package holiday to a city of your choice and discover must see attractions, world-famous sites, delicious food and plenty of bars and nightlife as well as shopping experiences, an abundance of culture and great weather every season. Checking in online will make your travel experience not only quicker but a lot easier too! To Check-In online you can either download the Opodo App or use the website to access 'My Trips' where from there, you can access your boarding passes. These can be accessed either before or at the latest 24 hours before departure date and will be delivered to you via email. Some airports do not support the scanning of mobile boarding passes so it's important that you also print a paper copy. I've had a problem with my booking? If you have encountered a problem with the booking process, whether it be a technical issue or something different, it is advised that you do not make a new booking. Firstly, check your inbox or your spam folder to see if you have received a notification. The e-mail confirmation may be sent immediately however it may also take several hours to reach you. You should also check whether your credit card has been charged by Opodo or the Airline. Find more Customer Service Details here. Opodo is a top European travel service that provides fantastic savings on over 500 airlines, 150,000 hotels and more than 7,000 car rental locations worldwide. Opodo provide you with all the information you need to make perfect travel choices, as well as handy travel guides, air tools and quick online booking options for flights, hotels, car hire and flight and hotel packages. Opodo also offer travel insurance, car excess reduction insurance, cottage holidays, Eurostar breaks and handy extras like currency cards and airport transfers via their online website. Book all this, and more, today at Opodo and make sure you use a discount code from us to save money on all your travel essentials. We are constantly on the hunt for Discount Codes for Opodo to help you with your money saving. Our experts check dozens of sites for secret codes including NHS discounts, student sites & social media channels saving you time & money!